In my work I am trying to characterise aeolian signatures in marine sediments. Although the film is already quite some years old, for a good impression on my daily work click here for a short movie (in German) made for DFG-Science TV, or download the English version as an .avi file here (72 Mb, download by right-click). It’s now recognised that aeolian dust may have a large influence on the Earth’s climate, through for example it’s effects on the earth’s albedo e.g., through particles suspended in the atmosphere, and by particles deposited on glaciers, or by the fertilizing potential that chemical elements adsorbed to wind-blown particles may have. Please find an impressive movie here that I found on youtube. By collecting dust in the source areas, I try to understand what are the effects of dust formation, entrainment and transport on the particles that make it “out to sea”..
By collecting present-day dust from the atmosphere, I try to ground-truth the inferences I make from wind-blown dust found in deep-marine sediments. By collecting / monitoring dust deposited on the ocean, I try to understand the consequences and marine-environmental effects of dust deposition. 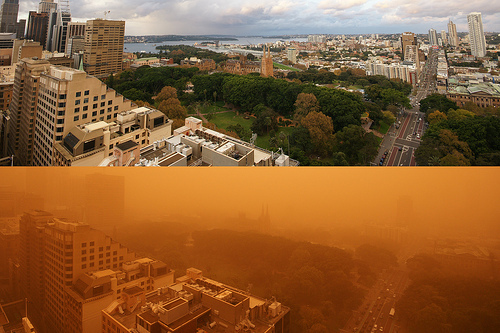 Together with Patrick De Deckker (ANU, Canberra, Australia) and Australian and German colleagues I was awarded an ARC grant to study Australian dust. In June 2007 we had our first field trip. There were four more field trips in September 2007, March 2008, February 2010 and June 2013. All in all we learned a lot from these field trips, especially about the enormous differences in source areas and their resulting dust emissions. It also gave us a fair understanding of how large dust outbreaks like the ‘red-dawn event’ in September 2009 can happen. 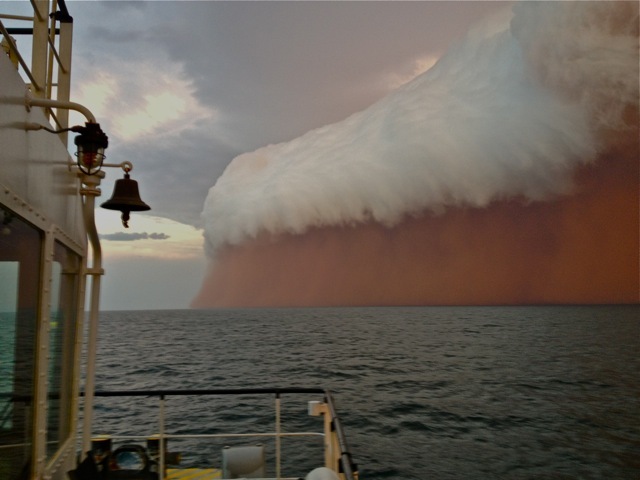 By collecting dust offshore NW Africa for the first time during expedition M41 (1998) with the German Research Vessel Meteor, we demonstrated that meteorology plays a key role on both the quantity and quality of the dust that is transported in dust outbreaks. Especially the altitude on which the dust is transported is of vital influence to e.g., the size of the dust. With the new array of instruments between Africa and the Caribbean, we can now show how “giant” particles (>100µm) can be transported across 1000’s (thousands!) of km across the ocean. Dust outbreaks are obviously widely studied through satellite images, but one of the disadvantages of these studies is the lack of control on the altitude at which the dust moves. By using weather balloons that were launched from the ship, we have an idea about the vertical structure of the atmosphere and hence could define the layer of maximum transporting capacity. Thus we could show that it is the Trade-wind layer that carries the bulk of Saharan dust into the Atlantic Ocean, and not e.g., the Saharan Air Layer (SAL), which travels at much higher altitudes. Back in 2004, Maarten Prins and I have started organising topical scientific sessions on aeolian dust for the EGU meeting in Nice, and continued to do so since. During the Fifth Assembly of the European Geosciences Union (EGU), 13-18 April 2008, Andreas Baas, Peter Knippertz and I for the first time have organised an interdivision session on Aeolian dust, incorporating the three divisions geomorphology (dust as initiator of environmental change), atmospheric sciences (dust as player of e.c.) and climate (dust as recorder of e. c.), and repeated that session every year. This merger resulted in really interesting interdisciplinary sessions, which we’ll repeat for the 14th time in 2017. Besides, in 2000 we have set up a theme in G3 on Aeolian dust€�, see the G3 website for these publications. Elsevier also picked up the growing interest for aeolian research by launching the new journal: Aeolian Research€�.